Copyright © 2015, Evaluate Ltd, All rights reserved. Do you need a resource for life science market intelligence? 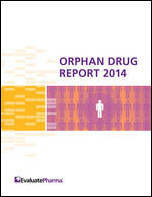 In 2020 orphan drugs are expected to account for 19% of the total share of prescription drug sales excluding generics, reaching $176 billion in annual sales, according to the new EvaluatePharma Orphan Drug Report 2014. At 11%, growth in the orphan drug market is set to be more than double the 5% growth rate of the overall prescription market excluding generics - view infographic here. This year’s report also includes pricing estimates based on EvaluatePharma's new USA Sales, Volume and Pricing Analysis. In 2014, the average orphan drug cost per patient per year was $137,782 compared to an average of $20,875 for a non-orphan drug. To download your free copy of this report, please confirm your details on the opposite form.